Former MK Yehuda Harel asks why PM requested Trump recognize Israeli sovereignty over Golan Heights without recognizing Jerusalem first. Former MK Yehuda Harel, a resident of Kibbutz Merom Golan who was one of the leaders of the campaign to annex the Golan Heights in the 1980s, told Arutz Sheva that Prime Minister Binyamin Netanyahu's request that the Trump Administration recognize Israeli sovereignty over the Golan Heights is unnecessary. "I am in favor of recognizing the Golan Heights, but the State of Israel already recognizes the Golan. If you need the recognition of the US, then first recognize Israeli sovereignty over West Jerusalem," he said, adding that the passports of US citizens born in the western half of Israel's capital, which has been under Israeli sovereignty since 1948, only say 'Jerusalem' as their place of birth and do not mention Israel. "So, first recognize Jerusalem [as part of Israel], then recognize Jerusalem as Israel's capital and move the embassy there. 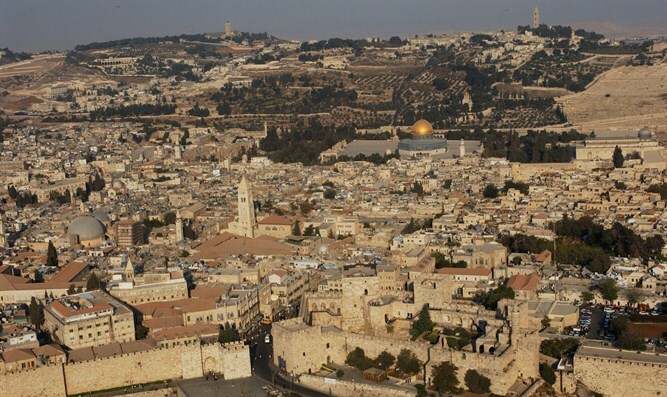 In terms of the UN, it declared with the establishment of the state that Jerusalem was an international city. The US also says all the time that the status of Jerusalem will be determined as part of the future agreement between Israel and the Palestinians," Harel said. Harel does not understand why Netanyahu brought up the issue of the Golan Heights when there is little pressure on Israel to give up the Golan due to the Syrian civil war. "I do not oppose the Prime Minister for bringing it up, but the Golan Heights have been under Israeli sovereignty since '81, and that is recognized by every Israeli citizen. Therefore there is no need to bring it up as part of the agenda. Rather, the focus should be on the growth of the Golan Heights."